I must admit, I rarely open a bottle of white wine. Perhaps I have replaced it by having sparkling and also the absence of fish (and vegetarian) food from our diet might have something to do with it. However, when I go for a white, it is often a Riesling. And I definitely do not regret opening the bottle of Emrich-Schönleber as it was well worth the try. Emrich-Schönleber is a true family business. The father Werner Schönleber is focused on the vines and that they thrive as they should. The son Frank has his main responsibility over the cellar and follows the process from wine to bottle. The mother of the family (Hanne) and Frank’s wife Anja are managing the customers. So the entire family is involved. They are focused on high-quality single vineyard whites and are in the market to make an impression. They focus on bringing out the distinctive flavors and characteristics of the grapes and terroir and making wines with a personality. They mainly have Riesling (85%) but also Grauburgunder, Weißburgunder and Müller-Thurgau in their vineyards. The dominance of Riesling can be seen in their production but with this high quality Riesling’s I am not objecting to that. They have won numerous awards during the years so it is no doubt that they are a high quality producer. Producing around 130 000 bottles a year they are not small but still not huge either. Still the benefit of this level of production is that their wines are reasonably easy to find. The wine we tasted was their 2012 Riesling Nahe. We had opened the bottle already in the summer with the Coravin (more on the Coravin to come in separate post but for now we will just say that is does what it is supposed to), but it did not show any signs of oxidation when opened six months later. The color was golden yellow and the initial impression on the nose exotic with fruity elements. When tasting the wine I expected something sweeter but instead was met with a fresh mouthfeel, nice citrus zest and clear and distinct notes of mineral. Not surprising with the mineral but more interestingly there were hints of cucumber and saffron (!). Very exotic indeed. It felt like a cool and humid summer morning (like the ones we have here in the Nordics). A truly wonderful wine experience, have it with food (could go well some seafood or chicken) or just as it is. I would rate it as a 4 for quality and at 179 SEK (around €20) at the local monopoly it is also a solid 4 for value for money. Amisfield Pinot Noir is one of the many nice Pinot Noir’s coming out of New Zealand in general and central Otago in particular. Amisfield was founded in 1988 as a specialist producer of Pinot Noir and aromatic white wines. The Amisfield vineyard is in the central Otago area close to the shores of Lake Dunstan. Historically it was actually a high country sheep station for merino sheep. In 1999 planting commenced with four varieties of Pinot Noir, Pinot Gris, Sauvignon Blanc and Riesling. It took three years, until 2002, before the first vintage was produced. They are currently producing around 20 – 30 000 cases of wines per year and the majority of that is Pinot Noir, accounting for around 60%. So no surprise it was the Pinot Noir, the 2010 vintage, I encountered at a recent restaurant visit. The restaurant had a fairly overpriced wine list (cheapest sparkling at $50+) but I was happy to find this very exciting Pinot Noir from Amisfield and none less than the RKV 2010. Amisfield are also committed to sustainable production of wines and are doing a great deal to produce wine that has as little environmental impact as possible. Ther motto is ‘working with nature, not against it’. It is something that is very admirable and I of course prefer a wine produced in this fashion. The do also run a very nice looking restaurant and wine bar close to Lake Hayes. The pictures of it makes me really want to go and visit. This specific Pinot Noir is produced only in exceptional years and may be very difficult to come by as volumes are not that big either. When the wine was poured the dark ruby red color was what the first thing that caught my attention. It is of course not unusual to see the New Zealand Pinot Noir’s being much fuller and darker in color than the Burgundian Pinot Noir’s. This was in a sense a clear example of the more full-bodied Pinot Noir that often can be seen from New Zealand and the alcohol level is also higher than one would normally find in for example many French Pinot Noir’s. The aromas of this wine was remarkably full and complex. The aging on French Oak barrels could be noticed in the nose mixed with dark fruit, spices and hints of leather. The flavor is intense with a mix dark berries, plum, spiced oak but I also could sense some earthy flavors and licorice. The wine is really full and has a powerful finish. It is a really nice Pinot Noir and I do appreciate this type of wine. My personal preference is normally the lighter Pinot Noir’s, that feature more subtle flavors. This is more a wine that knocks your socks off and it goes really well with food. Despite the full flavor and fruit it is balanced enough to avoid having sweetness mixed into it so how can one not love it. I know I do! A very nice wine and I would rate it as a clear 4.5 for quality. At this instance I had the wine at a restaurant at approximately 40 SGD (around €25) a glass but I have seen it available in some online stores for around for around €60-70 for a bottle and that would be deserving a value for money rating of 4. I am very intrigued to sample some of their other wines as well and especially since I have seen that the have launched a sparkling wine as well. All the pictures used in this post are courtesy of Amisfield winery (the lighting at the restaurant was insufficient to take decent pictures) and a special thanks to Debbie at Amisfield for providing the nice pictures and a lot of useful background information. To balance out the lack of wine here in Asia, I have saved up a few (more like twenty) reviews on some wine action from our trip to London over New Year. Today I thought I would write about a new acquaintance, Vagabond Wines. Its a lovely mix of a wine store and bar. I just love the concept. It’s a place where you can go hang out, talk wine, and browse around sipping wine from their numerous tasting machines. This is the type of place I miss having in the Nordic monopoly-countries. Vagabond has two locations, this review is about their second location on good old Charlotte Street (my star restaurant Bubbledogs is also there). The first one is in Fulham. This location has more of bar feel to it but they also have an extensive selection of wines to buy of the shelf. However, if you wish to browse for wines to buy with you to take home, it may be best to do this before the evening crowd wonders in. The selection is fairly broad both from traditional Europe and New world, especially the US. They have good descriptions for each wine making it easy to pick out something you like. The tasting machines also makes it possible for them to have some rare wines available for retail, as one can have a small sip before making the purchase decision. The shop has seating on two floors (entrance and the basement). The entrance level is a bit nicer but can also get chaotic on a Friday afternoon and evening. They accept reservations so that’s probably a smart move if you want to be guaranteed a seat after 6pm, especially Thursday-Saturday. You can buy wine at the bar both by the glass (bubbly) and also via the sampling machines. To use the machines you load money onto a card. The card is then inserted into a machine and with a press a button you select which wine and size of glass you want to sample (three options from a small sip to a full glass of wine). The small tasters start at around £0.6 (and go up-to around £4) and the glasses of wine start at around £4 and then go upwards. All the bottles they have for retail sales can also be enjoyed in the bar for a small £10 corkage fee. They also have nibbles and shared platters of cheese and cold cuts. We tried the charcuterie board and I must say it was delicious. A perfect snack to fend of the hunger before heading for a late dinner. It was plenty of food for two to share, and made it possible for us to skip starters for dinner. There are a lot of nice wine shops and bars in London, but the staff is often what makes a difference for me. At Vagabond they are friendly and really knowledgeable, we could have stayed for hours just chatting about wine. My recommendation is to stop by during the slower part of the day to have more of in-depth discussions on wine as the evenings tend to be a bit too busy for that. The reason I do not give it a 5 is the price level. It’s a bit steep on some of the wines (saw a Gramona Allegro Cava for £20 and that is below €10 in Spain (and even in Sweden or Finland where the alcohol tax is notoriously high and the price level generally higher it would be cheaper). This may not be the fault of Vagabond, but rather the importer or how Gramona want’s to position themselves on the market, who knows. The atmosphere is however great and they do have other interesting wines: a house Champagne (did not try that one) and a very nice Franciacorta by the glass. So I am 100% sure I will be back. For anyone around Charlotte Street (Tottenham Court Road) in the mood for a glass of wine Vagabond is a great option. It may also be nice place to hang out while waiting for a spot at Bubbledogs. So here is my first review on the How to spend it -section: Jacques Selosse Initial Grand Cru Blanc de Blancs Brut. I am often very torn with wines and Champagnes that cost over 100 € a bottle. Yes, I buy them sometimes for curiosity’s sake . However, I am not completely sure if they are worth the money. 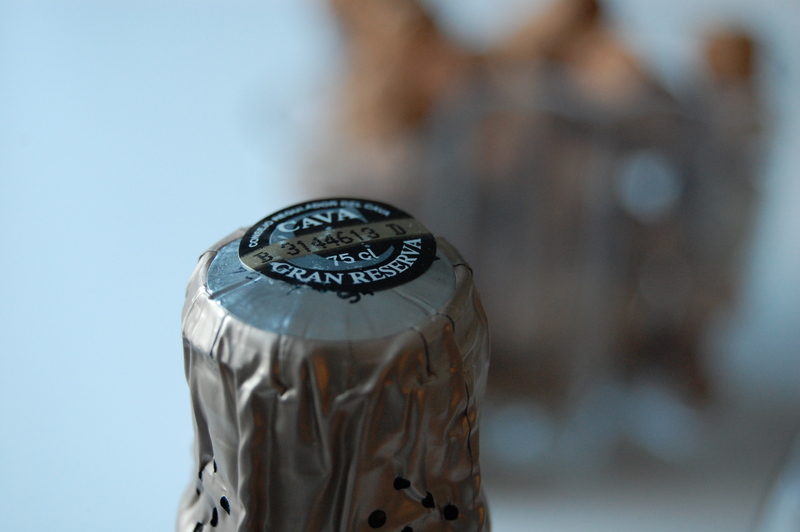 If we take the Krug Grande Cuvee for example, its a wonderful Champagne. 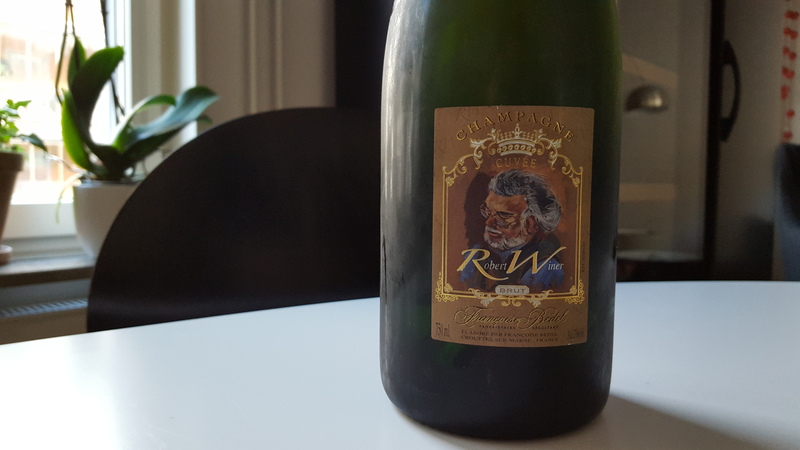 But is it that much better in proportion than a good standard Champagne like the Francois Bedel, one of my favorite Champagnes in the 30 euro section? I think that the Krug is better, definitely, but is it really four times better, which would be in line with the price difference? This is just my thinking around the price of wines, but of course I know that it’s not how the world of supply and demand works. Taste is taste and a price of a Champagne is not 100% in line with quality or the cost of production. Price is mostly (but not completely) determined on how much consumers are willing to pay for it. Back to the Selosse. The winemaker Anselme Selosse has a bit of a cult status. He divides opinions like many charismatic characters. His wines start from around 100 € a bottle and vintages of course have a heavier price tag. When looking at the more expensive vintages, they do not however climb up to the price levels of a Vielles Vignes Francais or Krug Clos du Mensil, but are considered by some critics to be of equal quality, thus great value for money. There are however numerous experts who also find his wines, if not awful at least poor so be aware that opinions differ on the topic of his brilliance (or lack thereof). So before splurging 100 € or more consider whether you believe you will like it. 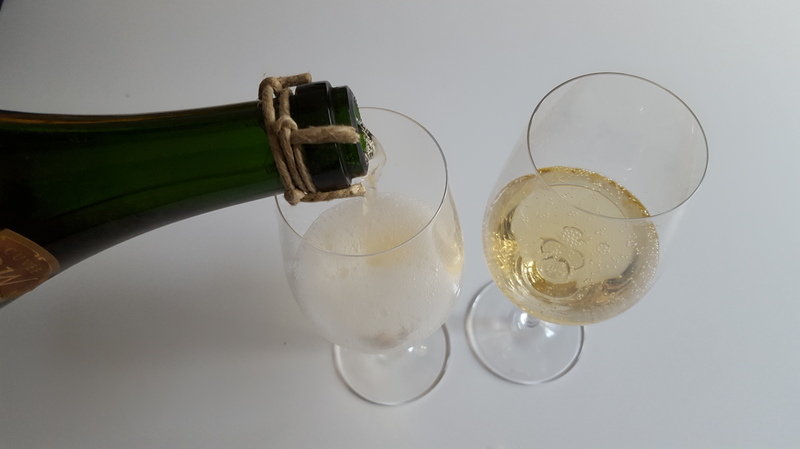 We started with the Selosse Initial because, well, we could get or hands on it, and as its name suggests, it is a good starting point to get acquainted with the Selosse style. The wine is quite light colored with small bubbles. The nose is brioche-like with marzipan and almonds. One can also get some peach, citrus, honey, yellow apples and minerals. There is a lot going on in this wine. 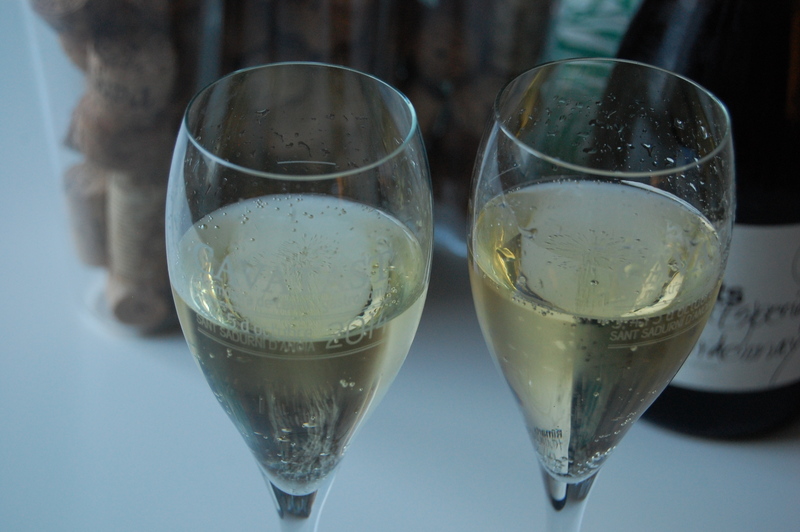 The taste is much fuller than many other champagnes with some acidity and notes of apples and citrus fruit. There is an interesting slight bitterness in the aftertaste that gets stronger when the wine warms up. If one can say a wine is complex, this is it. Its not just cold dry and sparkling, it has a lot of character. It reminds me of the Horiot Champagnes that are like great regular wines, just with bubbles and both producers seem to have a similar philosophy, they do whatever they want (not what is expected). One tip for drinking it though. Pour a small glass at a time and keep the wine cool in the fridge. When it warms up you get a bit of an overwhelming zesty lemon bitterness that is not as pleasant as of you would have kept the wine chilled. Ok, I am sold. The Selosse Initial is a very, very good Champagne. I would recommend pairing it with some food, not sure what exactly, but light meats and seafood would be a good start. The quality of the wine definitely gets a 4.5. I have not gotten over my dilemma yet regarding the price vs quality ratio. Perhaps I will over time. I would say the drop is minor though and the value for money rating is a 4. One thing to consider as well before getting carried away with Selosse purchases. Anselme Selosse has mentioned in several interviews that he wants to make wines coherent to what each year has to offer, not a product that tastes the same from year to year. To me this keeps things interesting, but it also means that quality will vary. This is just good to know for managing expectations. Anyway, I am now amongst the fans and very happy to have another bottle in the fridge and that’s already a sunk cost so no point worrying about the price of it. I like white wine, I really do. But I don’t have it very often. Perhaps because I don’t know that much about it. I have thought about starting to acquaint myself with reds and whites region by region. Its much more interesting to buy when the label says something to you. Daniele Piccinins Montemagro is something I picked up in London at a place called 40 Maltby St. Its a wine bar and kitchen located in an old railway arch in Bermondsey. The restaurant is connected to the warehouse of Gergovie Wines, an importer specialized in ecologically produced wines. You can taste the merchandise by the glass or buy a bottle to have at the restaurant or take home. Upon a visit to the restaurant and after chatting to the staff about what I like in wine they suggested I try something they just had one bottle of. And after one small taster of the Montemagro, I was convinced this is a white wine I want to get to know and have in my cellar. As it was at that point only a sample bottle, we had to return a few times until they got the shipment in. But since 40 Maltby Street is such a lovely place that was a great excuse to go back (as if I need an excuse). The grape Durella, is a grape that has been long ignored not only in Italy but everywhere. The variety has been called rabioso (furious) due to its high acidity. The color of the Montemagro 2010 is very yellow and it is low on residual sugar (0,3%). The nose is bready and has a hint of yeast and the taste with plum and raisins, but not sweet. It is like a non-sweet dessert wine. The wine is veary pleasant, not rabioso at all. Price-wise this wine was very reasonable. I cant remember exactly, but something close to 15£. For white wines especially I am a bit more sensitive when it comes to price. I guess its because the selection is so large, that I expect to find a good white for around 10-20£. But what is to say that will not change with some more education. Five years ago I thought 15£ was a high price for a bubbly too. All in all I give this wine a 4, both for quality and price. I think they are both aligned. I am also very intrigued to try more from both Danielle Piccinnin and wines made of Durella. Yes I know that I said that I would not be posting as often as Soile and now here I am posting almost right away after my introduction. Well, what can I say. When inspiration strikes I am just unable not to share my thoughts. There is this ongoing debate on whether there are any sparkling wines from other regions that can compete with Champagne. 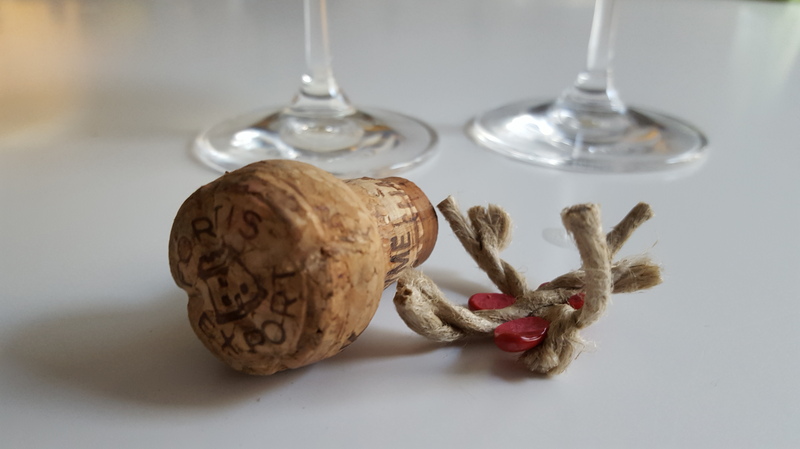 There are purists, like well-known Champagne expert Richard Juhlin, who claims that even the worst Champagnes are better than what other regions can produce. I do not agree with that – there are some brilliant Champagnes but there is also a lot that is produced in Champagne that is not at all very good. Taking value for money into account there is also a lot from other regions that is more interesting than Champagne. I do however in general find that the method used in Champagne is key to making a good sparkling. I have had excellent examples of sparkling wine from other parts of France, Spain, Italy, the US, South Africa and New Zealand (and we have some interesting bottles from Germany and recommendations for Austria as well) and what unites all of them is the Method Champenoise. 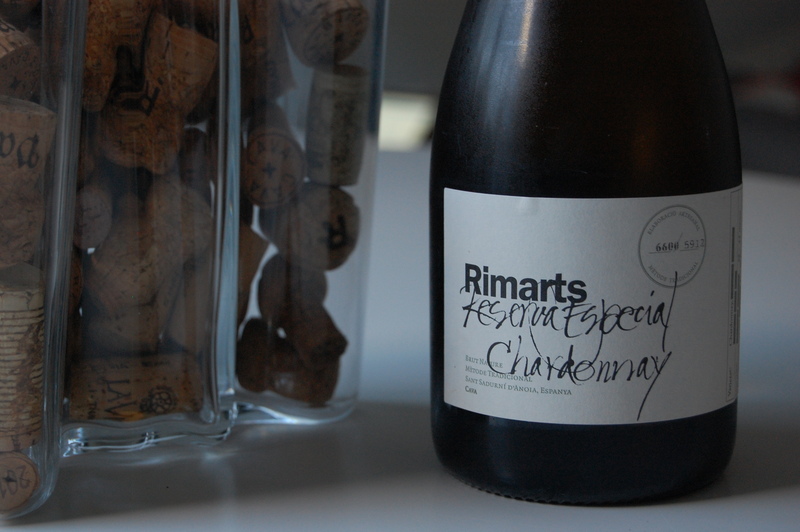 With this little introduction I want to highlight one of the very good value non Champagne sparkling wines out there. It is a South African sparkling made with the traditional champagne method – in South Africa this is indicated by the Méthode Cap Classique on the label. This specific one is Pongracz Brut. I had the pleasure of having a glass or two of it when visiting the lovely Yelp Community Manager for Stockholm. Pongracz is made with 60% Pinot Noir and 40 % Chardonnay and with 8g/l of residual sugar. It has been aged for 35 months. The name comes from the Hungarian Desiderius Pongrácz, a nobleman who fled the uprising in Hungary in 1956 and was one of the key people in shaping and developing the wine making in South Africa. The color of it is pale yellow and a the nose of it is really pleasant. It has clear scent of bread and crisp green apples and white fruits. The first time I smelled it i was surprised and I did really think this was a more expensive wine and for a moment I was even wondering whether it could be a champagne. The flavor is full with a toastiness to it but also clear notes of apple, nuts and mineral. The bubbles are small and pleasant. The aftertaste is fairly long and has hints of berries. It does present some really excellent value in most markets. For those in the monopoly markets it is available in the standard assortment in Finland for €14.90 (Alko) and the special order assortment in Sweden for 111 SEK (Systembolaget). I have also seen it in the UK for around £10-12. If you are also willing to venture on the ‘party boat’ going between Finland and Sweden it is also possible to buy them at Viking Line for a mere 82 SEK per bottle. In general I am not really a fan of the ferries as I spent way too much time traveling on them when younger and going to the summer house, but looking at the selection and prices at Viking Line there are some real bargains to be had and I will probably come back in future posts on the selection on board. I would rate the quality as a 3.5 (on a five grade scale) but in a value for money perspective this deserves a strong 4. Compared to other wines in the same price range it is really excellent. For me it still lacks something in the flavor, the nose is excellent but flavor-wise I would have wanted more full flavor to give it a higher quality rating. Still it is a lot better than many wines that cost twice as much and clearly a wine I could imagine drinking more of.